Chamberlain Lake Public Reserved Land is located in the unincorporated territory of Northwest Piscataquis in northern Maine. The lake forms part of the south end of the Allagash Wilderness Waterway, making it a popular area with canoeists. The protected land area surrounds the whole of Chamberlain Lake, providing multiple opportunities for recreational activities. Short hiking trails lead from the lake to two low mountains, providing views of the surrounding forest. The area is used by anglers, hikers, hunters, and wildlife enthusiasts in addition to canoeists on the lake and surrounding waterways. Chamberlain Lake is approximately 60 miles northwest of Millinocket, accessible from Telos Road. The area is open year-round and there are no entrance fees. Call 207-435-7963 for more information. Gero Island is located in the center of Chesuncook Lake in Northern Piscataquis. The mainland features the historic Chesuncook Village, most of which is encompassed by the Gero Island Public Reserved Land. Canoeists and anglers often camp on the island, which can only be accessed by watercraft. Call 207-435-7963 for more information. The Little Moose Management Unit is found in Piscataquis County, just west of Greenville. To access the land, visitors must traverse a gravel road off of Route 15 north of Greenville. The 15,000 acre unit features flatlands, rolling hills, and the Little Moose Mountain Range, offering a variety of topographies. Explore the mountains’ rocky streams and secluded ponds, which are popular with anglers. Hiking, snowmobiling, camping, and hunting are other popular activities in this area. The unit is free and open all year; call 207-778-8231 for more information. Moosehead Lake is Maine’s largest lake and one of the most popular recreation areas in the state. Mount Kineo borders the lake, featuring sheer 700-foot cliffs. The lake is home to landlocked salmon, native brook trout, and lake trout. Hunters use the land to hunt black ducks, partridge, white-tailed deer, wood ducks, bear, and moose. The land is open to the public throughout the year, and each season has its own activities. 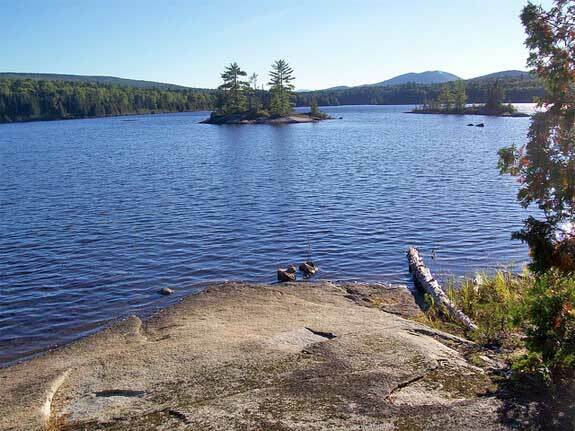 Whether you enjoy hiking, boating, canoeing, kayaking, camping, swimming, wildlife watching, snowshoeing, cross-country skiing, or snowmobiling, Moosehead Lake Public Reserved Land has opportunities for you. Call 207-778-8231 for more information. Nahmakanta Public Lands, located southwest of Baxter State Park in Piscataquis County, comprises 34,000 acres of low mountains and tall forests. The area features a multitude of narrow streams, small ponds, and bubbling brooks with excellent fishing opportunities. The state’s largest Ecological Reserve, an 11,802-acre expanse including the Debsconeag Backcountry, is part of the Nahmakanta Public Reserved Land area. Visitors must pay a day use fee at the KI Jo-Mary Checkpoint, located off of Route 11 on Jo-Mary Road; call 207-435-6213 for more information. Scraggly Lake Public Reserved Land is located northeast of Baxter State Park in the northern part of Penobscot County. Scraggly Lake is at the center of this unit, which consists of 10,000 acres of densely forested hills with a variety of bogs, brooks, and ponds. Boaters and anglers use the trailered boat launch to access Scraggly Lake. For those seeking a more remote backcountry experience, Ireland Pond is located just north of Scraggly Lake and sees fewer visitors. Because of its diverse ecosystems, Scraggly Lake Public Reserved Land hosts over 200 different species of fish, mammals, and birds. To get to the land unit, follow Route 159 from Shin Pond to Scraggly Lake Road. Visiting the property is free; call 207-435-7963 for more information. Since Native Americans came to this region 13,000 years ago, Seboeis Public Reserved Land has been traversed for its fishing opportunities, abundant wildlife, and natural beauty. The 15,628-acre tract of land, located near Millinocket, features a several lakes, wooded islands, and a spectacular view of Mount Katahdin. Anglers visit Seboeis Lake, Endless Lake, and Turtle Pond in search of salmon, white perch, yellow perch, splake, small-mouth bass, and brook trout. Hunters use the area to seek moose, bear, deer, and waterfowl. Other recreational users include snowshoers, hikers, cross-country skiiers, ATV riders, snowmobilers, and swimmers. The land offers 15 campsites, including some on wooded islands accessible only by watercraft. To get to Seboeis Public Reserved Land, travel south from Millinocket on Route 11. There are no entrance or camping fees; call 207-941-4412 for more information. Telos Public Reserved Land is located just south of Round Lake in the Northeast Piscataquis area of Aroostook County. This 23,000-acre unit is remote but frequented by numerous canoeists every year. The lake is the most popular entrance point for the Allagash Wilderness Waterway, a remote canoe trail. The land features several campsites on Coffelos Pond, a popular spot for anglers. Cross-country skiers, hunters, snowmobilers, snowshoers, and wildlife enthusiasts also use this property. Although the State of Maine owns the land, the North Maine Woods organization manages recreation for this unit. Thus, there are entrance and camping fees associated with the property; call the North Maine Woods at 207-435-6213 for more information about current rates. Wassataquoik Public Reserved Land is located near Stacyville in Penobscot County. This land management unit includes miles of shoreline on Wassataquoik Stream and the East Branch of the Penobscot River. This area is popular with canoeists, who enjoy the swift currents of the Penobscot River. The rivers are also excellent fishing waters, attracting hundreds of anglers each year. Those interested in camping on the property may make use of primitive campsites located on the shore of Wassataquoik Stream. There is also a snowmobile trail that passes through the land, connecting Shin Pond with East Millinocket. To access the property, take the gravel road off of Route 11 in Stacyville. Recent bridge outages make it impossible to get all the way to the Public Reserved Land; vehicular access stops one mile from the property and users must hike the rest of the way. There is no fee to enter the property; call 207-941-4412 for more information.